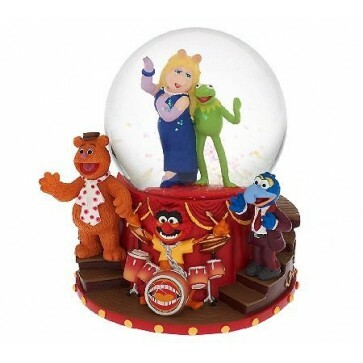 The Muppets Show Musical Water Globe Theme Song is a collectible item that fans of the hit cartoon will love. This spectacular ornament contains figurines of some of the most popular characters from the show in a musical performance. In the middle of the 4 inch water globe, are figurines of Kermit the Frog and Miss Piggy singing and dancing. Standing on stairs on the globe’s base are Fozzie Bear and Gonzo, while Animal plays the drums. This item plays music from the theme song too! Don’t miss out on this amazing The Muppets Show Musical Water Globe Theme Song.